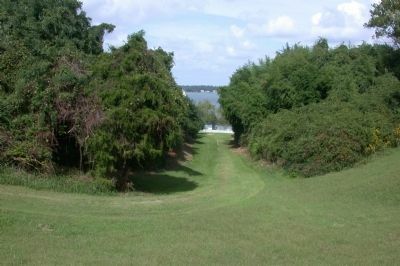 Before the American Revolution, this narrow footpath, cutting through the Great Valley, was a major thoroughfare that linked Yorktown's busy waterfront district with businesses and government offices on Main Street. At the head of the Valley were the Nelson stores, started sometime in the first decade of the 1700s by English immigrant, Thomas Nelson. Nelson's merchant business thrived at this location, and richly supported the efforts to repeal British taxes on imports. In 1776, four years after his death, his sons, Thomas and Hugh, were forced to close the family business due to the war. The marker is to the far left in this view roughly to the east along Main Street. The Dudley Digges House is in the background with the Great Valley in between the Digges House and the marker. including the Nelson stores. The town never recovered and fell into a quiet existence. 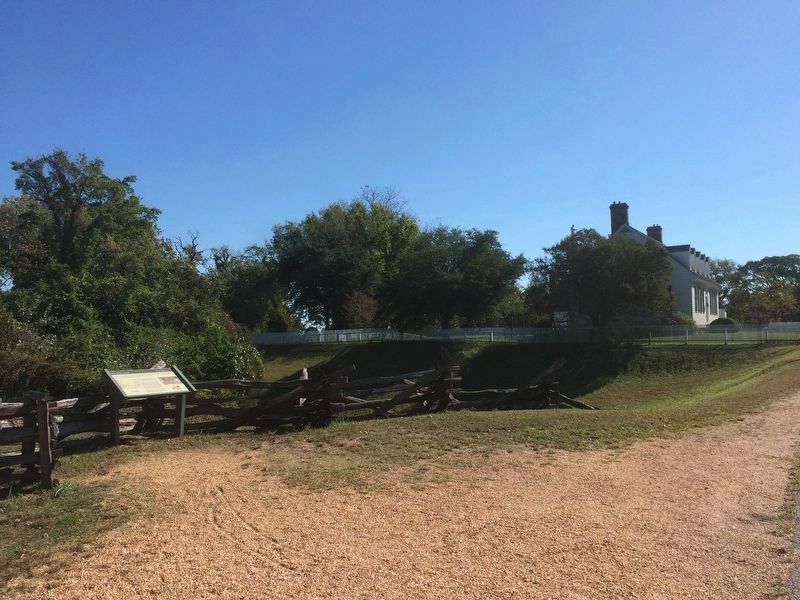 Erected by National Park Service: Historic Yorktown Colonial National Historical Park. Location. 37° 14.06′ N, 76° 30.408′ W. Marker is in Yorktown, Virginia, in York County. Marker is at the intersection of Main Street and Nelson Street, on the right when traveling west on Main Street. Touch for map. 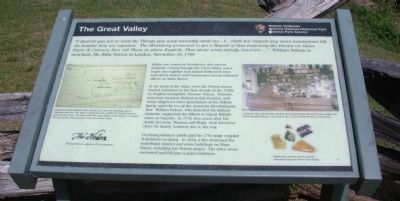 The marker is at the start of a trail which leads down the Great Valley north to Yorktown Beach and the York River. Marker is in this post office area: Yorktown VA 23690, United States of America. Touch for directions. Other nearby markers. At least 8 other markers are within walking distance of this marker. Nelson House, circa 1730 (within shouting distance of this marker); Dudley Digges House, circa 1760 (within shouting distance of this marker); Charles Cox House (about 300 feet away, measured in a direct line); Early Colonial Custom House (about 400 feet away); Custom House, circa 1720 (about 400 feet away); Cole Digges House, circa 1730 (about 400 feet away); Cole Digges House, circa 1925 (about 400 feet away); Somerwell House (about 500 feet away). Touch for a list and map of all markers in Yorktown. The view is from Main Street north toward the York River. drew this billeting map of Yorktown after the 1781 siege in preparation for some of the French army to quarter in the town. The map shows the Great Valley as two streets converging into one and the Nelson Stores at the head of the valley." 4. Eighteenth century pottery shards excavated from the lower Great Valley. More. Search the internet for The Great Valley. Credits. This page was last revised on October 24, 2016. This page originally submitted on March 20, 2015, by David Graff of Halifax, Nova Scotia. This page has been viewed 300 times since then and 7 times this year. Photos: 1. submitted on March 20, 2015, by David Graff of Halifax, Nova Scotia. 2. submitted on October 24, 2016, by J. Makali Bruton of Querétaro, Mexico. 3. submitted on March 20, 2015, by David Graff of Halifax, Nova Scotia. • Bill Pfingsten was the editor who published this page.